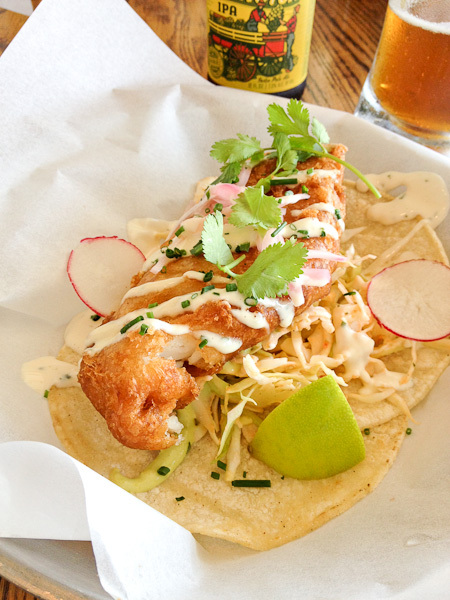 No visit to southern California is complete without having fish tacos at least once! They’re ubiquitous, synonymous with SoCal, albeit a south of the border import, and a delicious taste of the sea to savor after a day taking in the sand and surf. The three brothers of Wahoo’s Fish Tacos were probably the first on the scene when they decided to combine their love of surf and food in a small restaurant with a North Shore vibe in 1988. They’re celebrating their 25th anniversary this year and their restaurant family has grown into a mega fish taco empire of 90 locations! To commemorate this milestone they introduced a new Citrus Slaw taco and have been offering some amazing specials – like a beer for 25¢ with the purchase of any bowl or #2 combo this Thursday, July 25th. My favorite is still the #2 combo with one grilled Mahi-mahi fish taco and a carnitas taco with the original fresh toppings, rice and black beans (extra salsa and sprinkled with hot sauce) that has satisfied me and countless other customers since 1988. Looking for something low-carb? The Wahoo’s salad topped with the protein of your choice (I like the grilled mahi-mahi, my daughter always goes for the teriyaki chicken) is excellent. Wahoo’s Fish Tacos, 120 Main Street (714) 536-2050. Love Hawaiian poke? 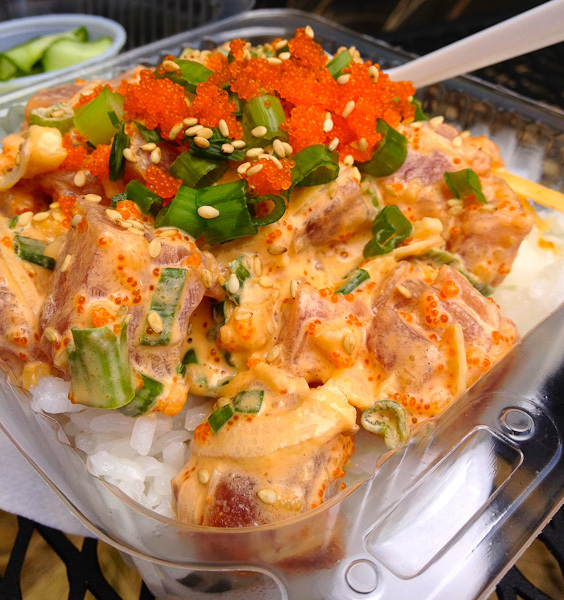 Head over to 5th Street between Walnut and Olive and hit up North Shore Poke. Opened in March 2012, this family-owned business only does the freshest Ahi or Salmon poke with your choice of brown or white rice and 5 different sauces: Pipeline, Waimea, Sunset, Haleiwa, and Off the Wall. You can add avocado and macadamia nuts and also substitute cucumber for the rice if you want low carb. 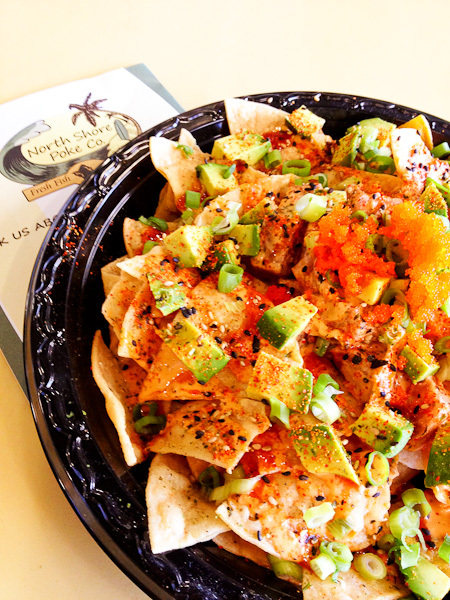 They also have a few dynamite specials like the amazing Poke Nachos and one mind-blowing dessert – Hawaiian Haupia Pie. For the uninitiated – poke is a Hawaiian raw fish salad traditionally served with a light sauce of sea salt, sesame oil and soy sauce on a bed of rice. North Shore Poke, 214 5th Street, 714-465-9011. At least once during your stay, you must get in your car and drive up Beach Blvd. to Slapfish (in the Newland Center at Beach and Adams). Slapfish is a modern seafood shack with a mission of serving the freshest sustainable seafood. Open for lunch and dinner, their seafood is so fresh – it slaps you 🙂 Slapfish offers a fine dining experience with the cost and convenience of a quicker service restaurant and culinary delights like fish tacos, lobster, fish sandwiches, shrimp, and more to satisfy every palate. As a partner with the Aquarium of the Pacific they’re serious about their sourcing as well as the flavors they bring to the table. Slapfish, 19696 Beach Blvd. (714) 963-3900. 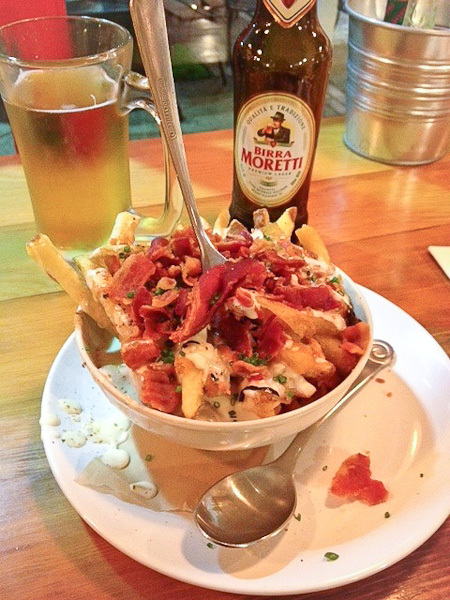 Chowder Fries – fries dunked in chowder and topped with bacon – a must try! 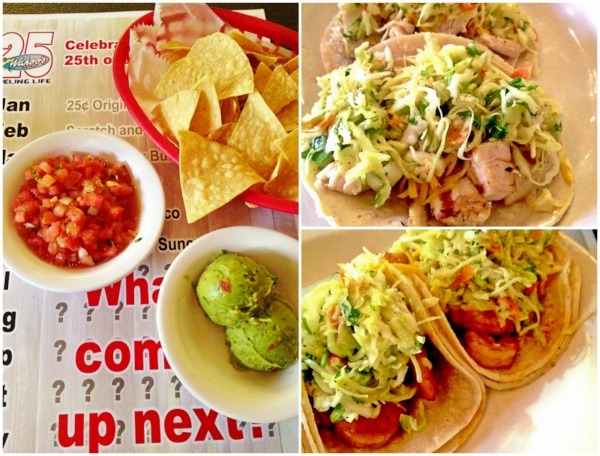 Slapfish’s Fish Taco – only order two if you’re really hungry! 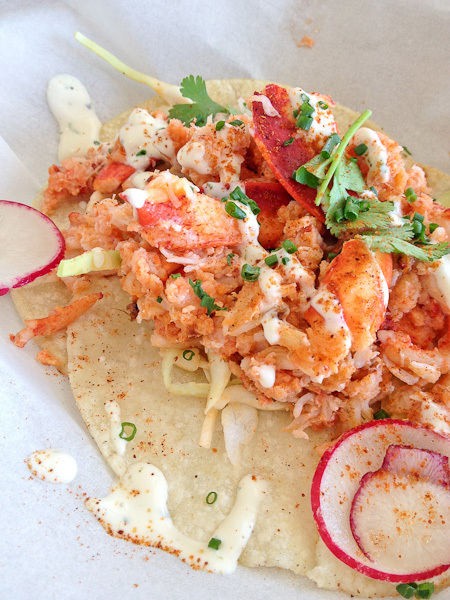 Or splurge on the Lobster Taco when they have them! 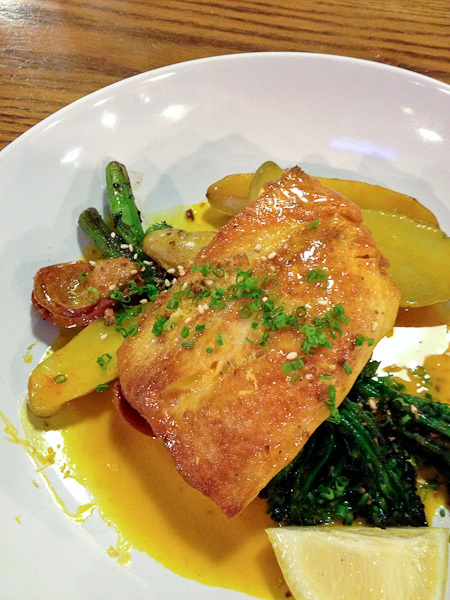 Fave for dinner: Line-caught Mahi-Mahi | carrot sauce, linguica, finglerlings, and broccolini. More good eats in downtown Huntington. Have fun while visiting Huntington Beach and, please, help us keep our beaches clean! You should head up this way during your visit to San Diego 🙂 But I know your friends will be keeping you busy there! Wow sounds like I’ll have to keep these in mind if I ever come out that way!